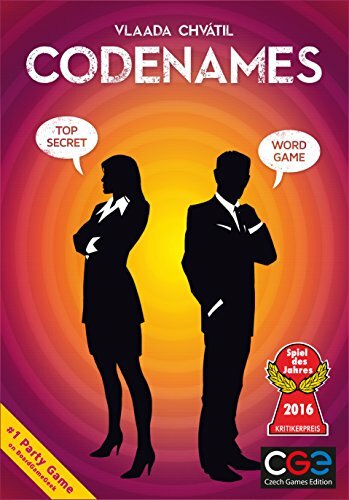 Codenames is an award winning word guessing game you can play with one other person or play with a large group. Two teams compete, deciphering clues to see who can find all of their agents first.The gameplay is super fun and cleverly simple. The game is rated for 14 years and up but we feel kids as young as 10 could play this game. Meant for 2-8+ players but we think the game plays best with at least 4 people or more. Playing time is quick, about 15 minutes. Only 30 seconds or so to set up, the game components are minimal and straightforward. It’s a complex yet simple deduction game fun for both kids and adults. Two teams compete to see who can identify all of their agents first. A grid of 25 cards (5×5) is laid out then players are split into two teams, the red and the blue team. Each team then chooses a leader, the spymaster, and everyone else becomes field operatives. 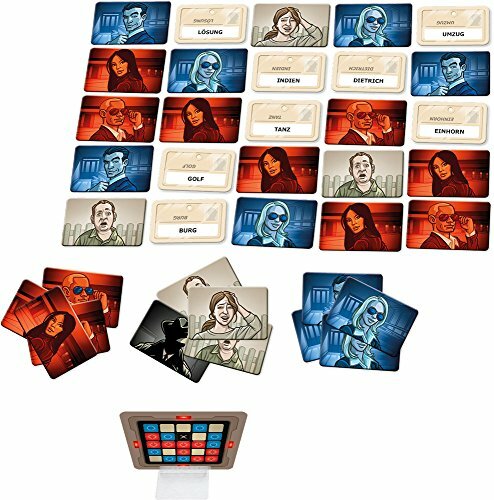 The spymasters are given a card that assigns each codename listed on the grid as an agent’s identity for the red or the blue team. Spymasters then take turns giving the field operatives clues (a word and a number). The field operatives must try to deduce their agent’s identities based on the Spymasters clues, avoiding innocent bystanders and the dreaded assassin. The first team to identify all of their agent’s identities wins! There are many layers to the gameplay- creative deduction, suspense, and cooperative play. This creates lot’s of room for frenetic competition with the opposing team and even within teams! The gameplay is deep yet simple, exciting and straightforward. It’s extremely quick to set up and play. It’s great for parties as it’s fun and easy to play with bigger groups of people. Codenames as oodles of replay value because of the nature of word guessing games. It’s super exciting, there are so many ways for the game to go sideways than everything fall into place at the last minute! Not great for 2 players It really works best with at least 4 players or more. Codenames can be tense and incredibly silly at the same time. It’s great for parties (a fun icebreaker and good for large groups) and as a filler game because of it’s short playing time. It has just enough complexity to make it incredibly engaging but the rules are delightfully simple at the same time.